In many these sisters were the highlight of the day. My 22 year old niece is named Ailbhe and when she was young nobody [even Irish people] could pronounce her name and funny enough the MC at Inspirefest did not get it correct on Friday [but to be fair she did correct herself]. One reason I mentioned my niece was that her younger sister was confined to a wheelchair for much of her life and she was always trying to customise her chair. One reason for confusion when it comes to pronouncing Ailbhe is that there is an Irish Saint Ailbe. Ailbhe Keane is has always been very passionate about art and design. Even as a little girl, she loved decorating her little sister Izzy’s wheels for special occasions. Keane founded Izzy Wheels in her final year at the National College of Art and Design, where she received a first-class honours degree. She created Izzy Wheels so that her sister’s wheelchair could reflect her bright and bubbly personality. 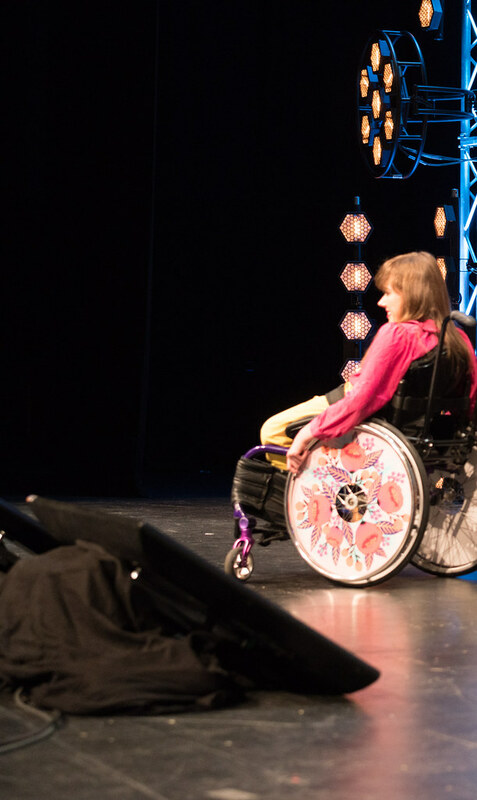 Izzy Keane was the inspiration behind the Izzy Wheels brand. Because she was born with spina bifida, she is paralysed from her waist down and has been a wheelchair user all of her life. Growing up, she found it very frustrating that there was nothing available for her to personalise her wheelchair. Keane proves to the world that you shouldn’t let your disability get in the way, you should embrace it. Saint Ailbe, usually known in English as St Elvis, was regarded as the chief 'pre-Patrician' saint of Ireland (although his death was recorded in the early 6th-century). He was a bishop, confessor and later saint. Little that can be regarded as reliable is known about Ailbe: in Irish sources from the 8th century he is regarded as the first bishop, and later patron saint of Emly in Munster. Later Welsh sources (from the 11th c.) associate him with Saint David whom he was credited with baptising and very late sources (16th c.) even give him a local Welsh genealogy making him an Ancient Briton. Saint Ailbe is venerated as one of the four great patrons of Ireland. His feast day is 12 September. He is the patron saint of the Archdiocese of Cashel and Emly.